CONTENTS: Persons marked in "hyperlink blue" below are covered in this report. If you are viewing on-line, you can click on the hyperlinks. Birth: abt 1674 Wales? England? France? The source of most of the information on the Maxey and associated families is “The MAXEYS of Virginia: A Genealogical History of the Descendants of Edward and Susannah Maxey”, Third Edition, by Edythe Maxey Clark, Gateway Press, Inc., Baltimore, 2000. This is a huge volume, and apparently very well researched and documented. Note: The Maxey name has been found in various documents spelled as Maxe, Maxcey, Maxcy, Maxy, Maxi, Maxie, Macksie, Macksey and McSey. Some branches today use the spelling Maxcy, Maxie, and Maxcey. But the names Massey and Massie are other families, not of thee Maxey lines. Some have claimed the Maxeys were Huguenots from France, but that is now disproven and the name “Maxey” will no longer get you into the Huguenot Society. The Maxeys did, however, marry into many Huguenot families. The Maxey name in England goes back to the 11th century, where there is said to have been an Organ Maxey of Cheshire. There is an ancient town of Maxey (and a Maxey castle, no longer standing) in the county of Northamptonshire, England. Maxeys were also found in other counties. There is no doubt our progenitor, Edward Maxey, came from the British Isles. The colony of Virginia Company, in order to attract immigrants, offered to award 50 acres of land to any person who paid another person’s way to Virginia. One who brought others into Virginia under this policy was William Byrd I (1652-1704), and he brought Edward Maxey into Virginia. Byrd needed to present a receipt to prove that the passage money had been paid, and Edward Maxey is named in court orders in Charles City County on 24 March 1691. Bryd had begun building his mansion house in about 1689 or 1690, and Edward was likely one of the white indentured servants committed to work for him for five or seven years in return for his passage. On 24 March 1725 he patented 400 acres of land in Henrico County (now in Powhatan County). On 17 August 1725 he added another 400 acres, and his son Edward Jr. also claimed another 400 acres. At the May Court in 1738, two years before his death, Edward was exempted from the payment of taxes, due to his advanced age. BEGINNING at a corner white oak of John Radfords land on Joneses Creek thence south one hundred chain to a corner black oak in a bottom of Fighting Creek thence east one hundred and sixty chain to an oak thence north one hundred chain to a corner oak on Radfords line thence on Radfords line one hundred and sixty chains to the place began WITH ALL woods underwoods swamps marshes low grounds meadows feedings and his due share of all veins mines and quarries as well discovered as not discovered within the bounds aforesaid and being part of the said quantity of four hundred acres of land and the rivers waters and water courses therein contained together with the privileges of hunting hawking fishing fowling and all other profits commodities and hereditaments whatsoever to the same or any part thereof belonging or in any wise appertaining TO HAVE HOLD possess and enjoy the said tract or parcell of land and all other the before granted premises and every part thereof with their and every of their appurtenances unto the said Edward Maxey and to his heirs and assigns forever to the only use and behoof of him the said Edward Maxey his heirs and assigns forever TO BE HELD of us our Heirs and Successors as of our Mannor of East Greenwich in the County of Kent in free and c ommon socccage and not in capite or by Knights service YIELDING AND PAYING unto us our Heirs and Successors for every fifty acres of land and so proportionably for a lessor or greater quantity than fifty acres the fee rent of one shilling yearly to be paid upon the Feast of Saint Michael the Arch Angel and also cultivating and improving three acres part of every fifty of the tract above mentioned within three years after the date of these presents PROVIDED always that if three years of the said fee rent shall at any time be in arrear and unpaid or if the said Edward Maxey his Heirs or Assigns do not within the space of three years next coming after the date of these presents cultivate and improve three acres part of every fifty of the tract above mentioned then the Estate hereby granted shall cease and be utterly determined and thereafter it shall and may be lawful to and for us our Heirs and Successors to grant the same lands and premises with the appurtenances unto such other person or persons as we our heirs and succcessors shall think fit. IN WITNESS wereof we have caused these our Letters Patent to be made WITNESS our trusty and well beloved Hugh Drysdale Esqr. or Lt. Governor and Commander in Chief of our said Colony and Dominion at Williamsburgh under the seal of our said Colony the Seventeenth day of August one thousand seven hundred and twenty five in the twelth year of our Reign. "I give to my Sone William Maxey the remaner of that track of Land it Joninge uppon William Sansdon and John Smith to him and his ares for ever. "I give to my Son Nathaniel one fether bed and bolster. "I give my Grandaughter Susannah Ratford won fether bed and bolster. "I give to John Dunkin a young mare of three years old when the said John Dunkin doth come of age. "And all the other of my Estate both reull and parsoul after my Deats and feneril Charges paid I give to my loveinge Wife and to hur Disbosinge and I make an Consecute my Loveinge Wife Susannah and my Sone Willim Excetors of this my last Will and in Witness whareof I have set to my hand and fixed my Seale yd 18 day of April 1737. "This Will was proved by the Oaths of John Mossom and John Capper to be the act and Deed of Edward Maxey Desed which was ordered to be recorded. FOOTNOTE: Some genealogies claim that the Edward Maxey who died in 1726 was the father of this Edward Maxey. However based on analysis in “The Maxeys of Virginia” it appears more likely that the one who died in 1726 was the son. That approach has been followed in this genealogy. Maiden name of Gates (or Gaites) not proven. James Gates probably son of John Gates mentioned in Susannah's will & a court document lends itself to credability of maiden name. Several web sites suggest she was Susannah HALES. "This Will made in the year of our Lord God one thousand seven hundred and forty three in the Sixtenth yeare of the Raine of our moste Souvrane Lord King Geore by the Grase of God King of Great Bretain France and Ireland Defender of the faethe. In the name of God Amen I Susannah Maxey being very sick and week of Body tho of parfick sense and memarey God be prased for it I doo willing and heartily Give and queue my Sole to God hoo gave it me and hoom I hope will recive it and my Body to the Earth from whense it Came there to be Desently Buried at the Descretion of my Executors. "Item I give to my Son John Maxey one pound one shilling and six pence and half a dossen putor plates. "Item I give to my Son Wilam Maxey One pound one shilling and six pence and half a dosson puter plates. "Item I give to my Datter Elizibeth Radford my Trunk and all my wearing Cloes. "Item I give to my Grandatter Susanah Epperson my Side Saddel. "Item I give to my Son Walter Maxey my other fether bed and furneture and two dishes. "Item I give to my Grandson James Barns one heffer of two years old. "Item I give to my Granson Charles Maxey one young mare of One year old. "Item I give my Son Silvanus Maxey all the Rema___er of my Estate and I desire that my Estate should not beprased. "and I doo apint and Constetne Silvanus Maxey to be my Sole Executor of this my last will and Testament In Witness whereunto I sett my hand and Seal this 31 day of May 1743. James Gates, Thomas Sraging Susanah Maxey Elienner boyef"At a Court held for Goochland County Septem 20 1743 James Gates and Thomas Spraggin proved this writing to be the last Will and Testament of Susanna Maxey which was ordered to be recorded." Most of the following information is taken from “The MAXEYS of Virginia: A Genealogical History of the Descendants of Edward and Susannah Maxey”, Third Edition, by Edythe Maxey Clark, Gateway Press, Inc., Baltimore, 2000. “Sylvanus’ second wife was Elizabeth ‘Betsey’ Langsdon, the daughter of William Langsdon (also spelled Lansdon) and Esther/Hester Jones. William Langsdon died in 1743 in Goochland County, and his estate was appraised by John J. Dupuy, William Maxey and John Bondurant. The widow Esther lived for many years and left a will in Powhatan County, Virginia, dated 17 November 1792, and proved 19 December 1793 by witnesses John and Horatio Maxey. She named her sons, William and John, and daughters, Elizabeth Maxey (she was bequeathed one shilling), Judith and Phoebe. A Charles Maxey is found of the right age, with a wife of the right age. There are younger adults in household, perhaps married child(ren)? They have 26 slaves. There is a “Clabon Marcey”, who is almost certainly the right family. The count and ages of the free whites in the household is a perfect match. They own three slaves. Clairbourne Maxey (indexed as Moxey) is found. Ages and head counts are right for Clairbourne, wife Ann, and the six youngest children. Count is confusing for others - think one of oldest sons (maybe our ancestor Robert Taylor?) is living there with his wife. And there is an extra female age 10-16. They own six slaves. There is one male under age 14, one male age 26-45, three females age 14-26, and one female over age 45. Robert Taylor Maxey was born in Buckingham County, VA. He made his first and only appearance on the personal property tax records of that county in 1821. Robert is buried with his first wife and daughter America in mathers Cemetery in Orange Township, Knox Co., IL. He is recorded as “Robert T. Maxuy”, but he and his wife are exactly the right age, and they have six children of the right ages (including our ancestor Frances Nixon, who would be age 3). Robert Maxey is found for twp “10 N 2 E”, dwelling #328, Image 11. He is age 50. His spouse is “Lydia”, age 25, and THEY WERE MARRIED WITHIN THE PAST YEAR (his first wife died 2 years earlier). Three children of correct names and ages are living at home -- Thomas, Susan and Catherine at ages 21, 15 and 10. Thomas is working as a “Laborer”; Susan and Catherine have been attending school. Robert was born in Virginia, Lydia in Indiana, Thomas in Virginia, Susan in Kentucky, and Catherine in Illinois -- offering good clues on family movements. They own real estate worth $1900. 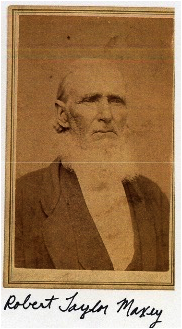 He lives near Bartlett Walker, dwelling #335, who has married his daughter Frances (see notes with Bartlett). Robt T Maxey is there, age 50-60. Ages for wife and first two of their children are right. There does seem to be an extra male age 10-20, maybe a hired hand? Also nearby (same page) are his sons Richard and Claiborne, and his son-in-law Bartlett Y. Walker. They got indexed as “R. T. Mary and wife Syddia”, but R. T. Maxey and Lydia are there. All the children are now Lydia’s, they are Charles age 10, George age 7, and Sarah age 4. He has real estate worth $5000, and personal estate worth $2000. All the kids were born in Illinois. All the children with first wife have moved on. Robert and Lydia are there, with right head count and ages on children. Robert is 70, Lydia (2nd wife) is 46. There are 4 children at home. Charles is 19, George is 18, Sarah is 14, and Mary is 7.